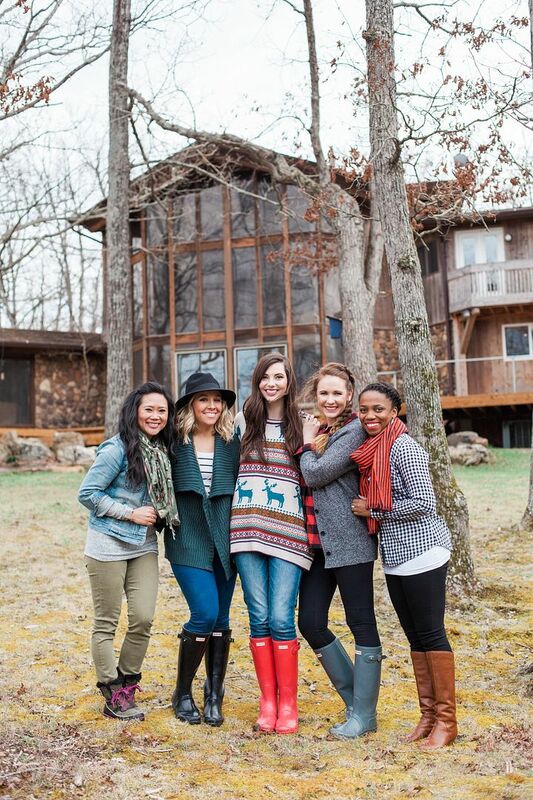 A couple of weekends ago, Jenna hosted a little blogger photoshoot at her parents' house on the lake! While the weather was a bit on the cooler side of spring, the location was gorgeous! Seriously amazing! Amy Rau was kind enough to shoot all of us together, and I think she captured every last detail perfectly! I'll be sharing bits and pieces of our little retreat throughout the week! If you don't know the other girls, you should! Please make sure you visit their blogs and say hello! This shoot was so much fun! 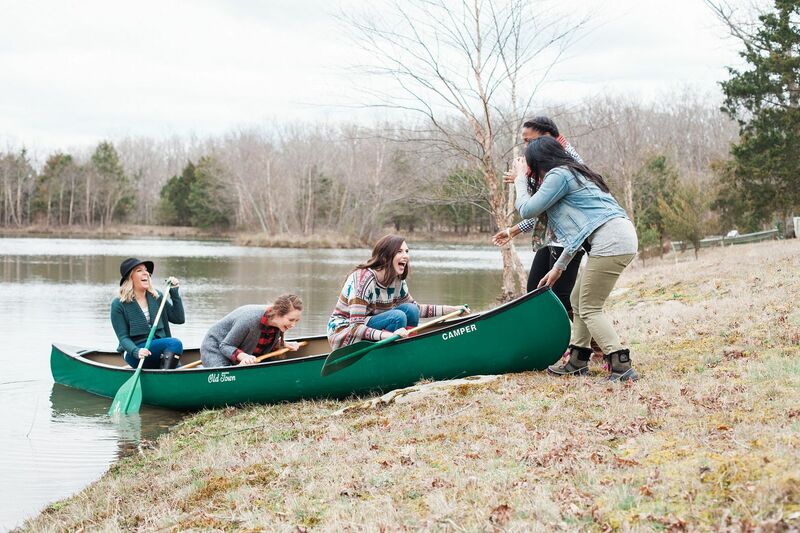 I mean, picture 5 fashion bloggers deciding who is going to brave the canoe! It ended up being a somewhat easy decision since the canoe can only hold 3-ish people, and 3 out of the 5 of us were wearing their wellies. Decision made! 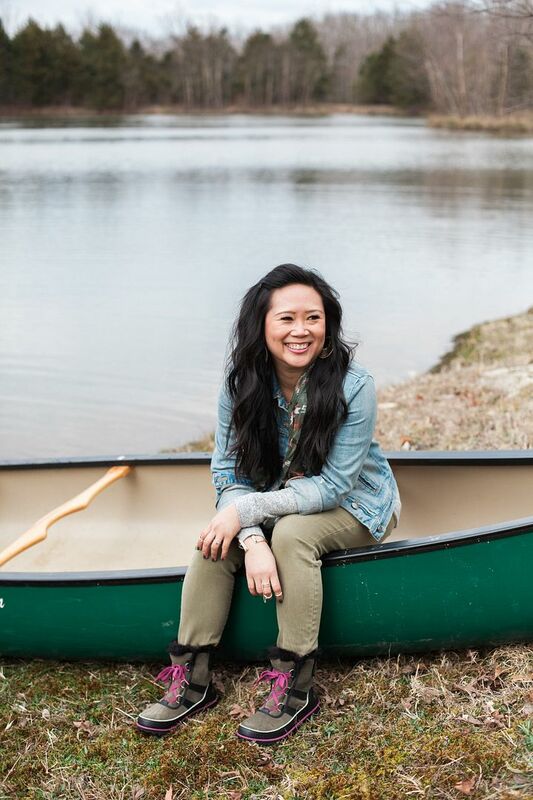 While I didn't actually get on the water in the canoe, it sure does make for a good prop! Sherlock is seriously the cutest dog ever, outside of my own two pups of course. He had to come out and inspect everything before he gave us the green light to start the boarding process. These are the most genuine laughs ever captured in a photo! So, what happened was…. Psyche and I were supposed to push the girls into the water on the count of three and Amy was going to capture the precious moment in action. We counted down - one, two, three, push! Psyche and I pushed with all our might and…. nothing. The canoe did not budge, hence the laughing! It seemed so precarious and unstable when they were boarding, we both figured that it wouldn't take much to push them in, but we were totally wrong. We managed to get them in the water on the second try, but it took about twenty times more effort than the first! These girls are even more gorgeous and fun in real life than they are on their blogs. This was such a fun collaboration! I'm thankful that blogging allowed us all to meet! We are all local to St. Louis with the exception of Annie who drove in from Indiana! She's a trooper! I'm excited to share the rest of these photos throughout the week! Next Monday we have a special surprise so I hope you'll tune in! Oh! And before I go - I wanted to congratulate Yulissa for winning last week's Charming Charlie giveaway! I've sent her a message to claim her prize! This loos fabulous and such a great bonding time with fellow bloggers. What a fabulous location! And it looks like you had a lot of fun, too. This is such a fun shoot, you all look so pretty and the pics are fantastic. How fun! I love your comfortable casual look. What a fun and relaxing way to connect with fellow bloggers! You all look great and love your casual chic look! These pics are super cute. Looks like a fun time! Such a lovely group of ladies! I enjoyed seeing the genuine laugh picture, very cute. 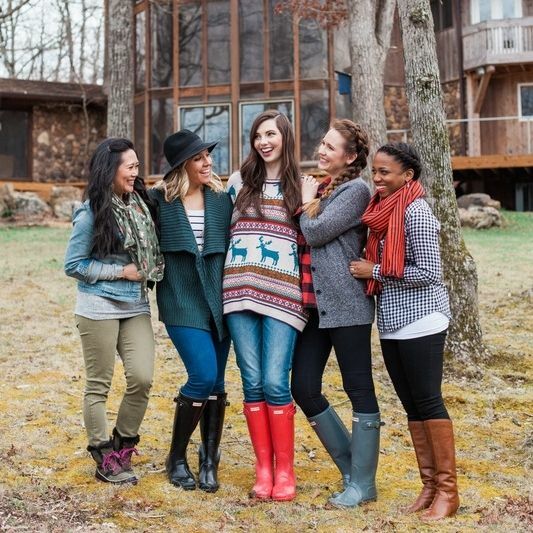 Mountain retreat gone glam! Love this! 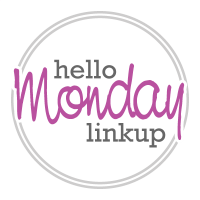 Wow a blogger retreat should be so much fun - Have a lovely Monday!!! The photos are gorgeous! She really did capture all the laughs and details! Happy Monday! Great photos! Looks like everyone had a blast! such a fun shoot with such pretty girls! I love this idea. Your boots are amazing!! This looks like so much fun! And that is too funny about the boat. How fun! 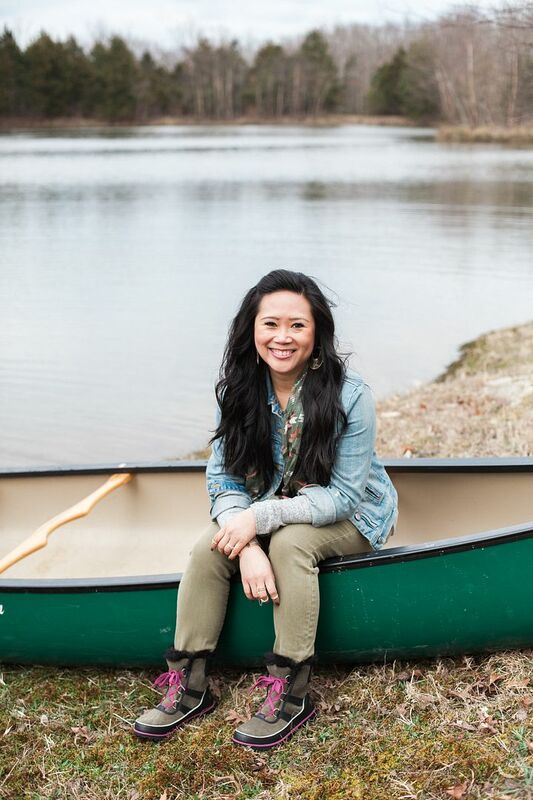 That canoe made for the perfect photo op!! Such a fun time and great location to shoot! 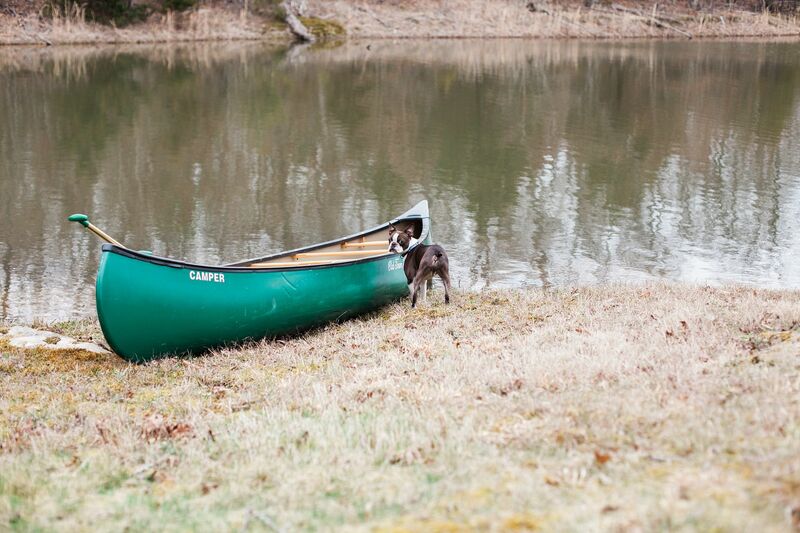 I love the canoe photo!! Oh this looks like it was sooo much fun!! I love the candid photos! This looks like such a fun time! I wish I could find some fashion bloggers in my area to collaborate with! You gals all look gorgeous, and what a pretty lake view! How fun is it that you gals did this?! Love the setting and these pictures are too cute! What a gorgeous location! That's so great that you have some wonderful bloggers nearby! Oh this looks like the most fun time! Great shoot, the boat pic is one of my faves and you guys have the most infectious smile! I'm cheesing as I'm reading the post!